I realized that I never posted pictures from our honeymoon! I wrote a gigantic post about my bridal shower/bach party/wedding/reception/honeymoon when I first started blogging and didn't know better than to break it down. Actually it was a journal entry that I copy pasted on our one year anniversary. You can go look and see if you really want to, but I will summarize just about our honeymoon here! I'm doing this as a Thoughtless Thursday post with Katie from Life in the Fulmer Lane! 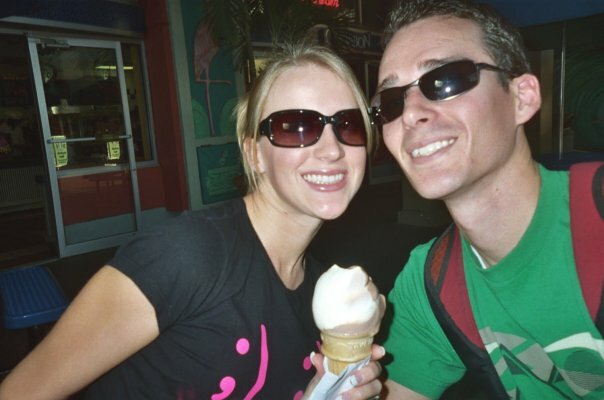 We started our honeymoon by staying at a hotel in Ontario, because we had a flight out of the airport there the next morning. The flights seemed incredibly long and we were more than ready to get settled in our beautiful suite at the timeshare that Mimi and Papa (Michaels grandparents on his moms side) let us use in Orlando, Florida as a wedding gift. When we got to Florida, we rented a Nissan Altima and drove to the resort and checked into our ROOMS!! It was HUGE and so nice! The views from BOTH of our balconies were beautiful. There was a man made lake with a lit up fountain in the middle and a resort lighthouse across the lake. Close by was a large pool area and hot tubs. There was a restaurant/bar we ate at one night right next to the pool called the Copa Loca. When we ate there, there were Polynesian dancers who hula danced and there was a teenaged guy who showed us some different cultural dances from several Islands. They asked if anyone had been married within the month and we raised our hands. We were the only ones! When they had us come up to the front in front of everyone, he asked us how long we have been married. When he found out we were on our honeymoon, he sang a slow song and had us dance. Later on the guy who danced and one of the women hula dancers took Michael and me up there and put grass skirts on us and showed us how to hula dance. It was embarrassing and funny at the same time. Especially seeing Michael shake his whole body! When the show was over we made sure to take a picture with the main singer. ...and on Thursday we went to the rides or attractions we missed and the ones we wanted to do again. On Thursday night we went to see the midnight showing of “I Am Legend”. I was really glad that I didn’t have to go home and sleep by myself. On Friday we took it easy and that night we went to Medieval Times. On Saturday morning we checked out and then went to Denny’s for breakfast/lunch because we had some time to spare. We returned the car at Payless and then took a shuttle to the Airport. The flights were bumpy but somehow we were able to get little naps in here and there. It was the best honeymoon we could have ever asked for! There was so much to do and it was so fun! We loved it! Cute! What's funny is that you came to Florida where I live for your honeymoon and for my honeymoon I want to go to California! Looks like fun! You were close to where I live! :) Fun fun. I love Orlando, especially Citywalk near Universal. Sounds fun! I love using other peoples timeshares haha! I thought that looked an awful lot like a Marriott timeshare! We stayed at the one in Palm Beach, FL, last October. They are really nice! We too heard the presentation on buying one, and if we were going to buy one, it would have been the one in Orlando! Ours was in Mexico. It was nice. Very nice. We had the time share sales pitch too. We got a dinner, something and horse back riding. And I am not talking a nice little trail. Though it was like that at first, no...it was through the countryside and across a rip roaring river that at the middle was up to my horses belly AND that thing wobbled. I was scared for my life. But it was truly an amazing experience. You guys are such an adorable couple! It looks like you had a blast! 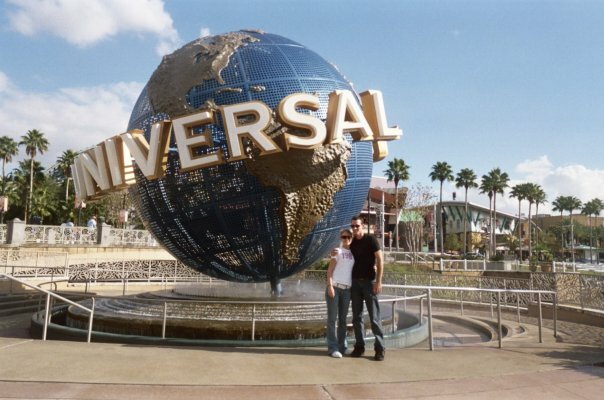 I am so jealous you went to Universal Studios! Harry Potter World is there! What an awesome honeymoon! You two are such an adorable couple. I love seeing pictures of couples and the love they share for each other is clearly, truly there. So nice to see two people so in love.